For years I, like many cooks, rarely measured ingredients. We eat a lot of hearty soups, salads, and one-pot meals in our house, and this sort of cooking lends itself well to the “a-little-of-this-a-little-of-that” approach. 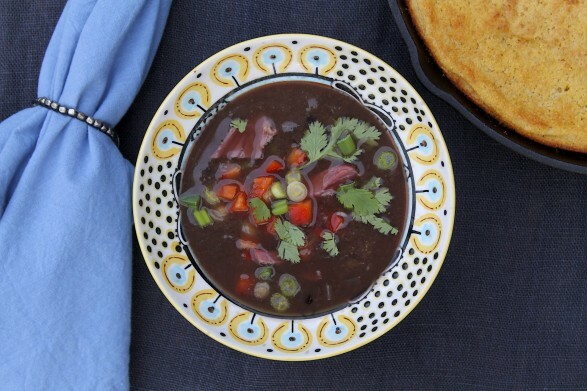 Black bean soup is a dish that I have made often over the years, yet until recently I had no firm recipe. So while this should have been an easy recipe to make, photograph, and include in this column, I ended up making it three times! The second time, I got the ham hock and adjusted the amount of liquid. As I finished simmering the soup in my usual way–on the stovetop–it occurred to me that many people might prefer to use a slow cooker for this recipe. Knowing that this version may require less liquid to achieve the same consistency, I made the soup one more time. (I did space out the batches and am happy to report that my family never tired of it!) To simplify the slow cooker preparation, I skipped the initial step of sautéing the vegetables. As it turned out, there was no perceptible loss of flavor with this helpful shortcut. I love it when easy and delicious go hand-in-hand. Another timesaving tip I often employ is to chop the veggies–in this case the onion, celery, jalapeño, and garlic–ahead of time and store in a covered bowl or plastic bag in the fridge. The last time I made this soup, I wanted to start it in the morning before I left home, so I chopped the veggies the night before. I also covered the beans with water and soaked them overnight. In the morning, two minutes was all it took to throw everything into the slow cooker, turn it on, and head out the door. 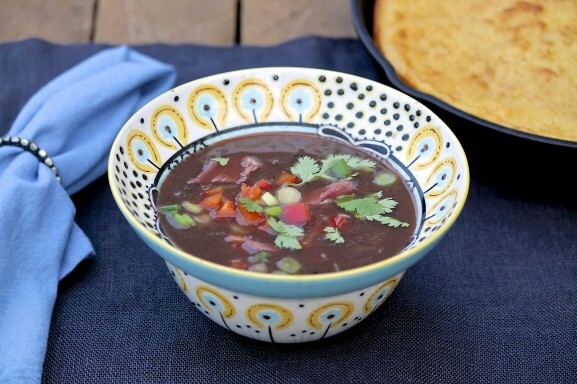 Hearty yet so healthy, this soup is a favorite in my family for its incredible flavor. I also love it for the ease of preparation as well as the leftovers, which improve with age. If the soup is finished cooking before dinner, I allow it sit at room temperature for up to two hours so the flavors meld and the soup thickens slightly. Then I turn the slow cooker or stove back on to rewarm when we are ready to eat. Although the soup is delightful without a single garnish, it lends itself well to a smorgasbord of toppings if you wish. The bevy of options makes this a fun, casual meal when entertaining. A side of cornbread pairs quite well, too. Yields around 8 servings (2+ quarts). Soak the black beans. There are two good options: First, you may place the beans in a bowl and add water to cover by at least two inches. Cover and let stand overnight or up to 24 hours, refrigerating if the kitchen is very warm. Drain well and discard the soaking liquid. Alternatively, for a quick soak, pour boiling water over the beans to cover by two inches. Let stand for at least one hour or up to a few hours. Drain as with the first method. For a slow cooker method: Place the onions, celery, garlic, jalapeño, drained beans, ham hock, tomato paste, and 7 cups of water in the slow cooker. Do not add the sherry, salt, or pepper at this point. Cover and cook on low heat for 7-8 hours or until the beans are tender. You may instead cook on high heat for approximately half the time. For both versions: When the beans are tender, remove the ham hock to a plate, and allow to cool for a few minutes. In the meantime, purée the bean mixture in a blender or with a handheld immersion blender. For ease, I like to use an immersion blender and keep the soup a little chunky. If you are using a blender and prefer not to completely purée the soup, blend half of the soup. Discard the ham bone and any fat, and dice or shred the meat. Return the meat to the slow cooker or pot along with the salt, pepper, and sherry. Cook for a few more minutes to heat through. At this point, if you prefer the soup to be thicker, you may simmer a few more minutes with the lid off. The soup will also thicken slightly as it sits. While I seldom use sherry, there are a few recipes to which it adds exceptional flavor. Sherry will keep for years, so there is no need to worry about spoilage if you purchase a bottle and use it infrequently. 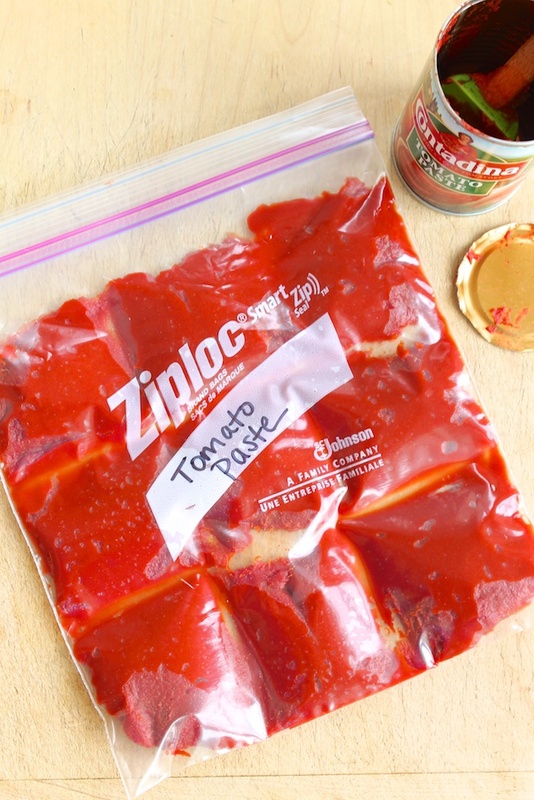 A great tip for leftover tomato paste: Place the unused portion in a freezer bag and spread into approximately tablespoon-size portions with your fingers or a dull knife. The paste is thick so it won’t run back together. Freeze and break off portions as needed. Note: A 6-ounce can of tomato paste contains roughly 10 tablespoons. Thanks so much for the great feedback, Wendy. I’m glad you saw the recipe in the paper and gave it a try. Coincidently, I just bought the ingredients today to make it here tomorrow! I also made this recipe after reading it in the paper. It was delicious! I am making it again today. My husband has been out of town and I can’t wait for him to taste it. I shared it with my restaurateur neighbor and he enjoyed it also. I’m thrilled you enjoyed, Joan, and truly appreciate the comment. Hope it’s a hit with your husband, too! I also made this after I saw it in the paper. I had never cooked a ham hock before and I had always used canned black beans. WOW! This is one of my all time favorite soups. I usually share with my friends, but it was so good I only shared 2 cups with my neighbor and kept the rest to myself. Also shared this at the food pantry where I volunteer. It is a relatively low cost meal and very healthy. I also had great feedback from the client with whom I shared the recipe! I am laughing, Ann…..because about a year ago, I ran into Jack at market and asked him if he knew where I could buy a ham hock and he took me to just the right stand! That is great, Ellen! He knows his way around market and the grocery store quite well and is a very good sport about going. He’s a keeper!